I find Gap very good for jeans. The offers, particularly if you go to a Designer Outlet store, are very good. However, with other items of clothing I have found the quality can be a bit hit and miss e.g. material quality, poorly stitched seams. Gap pyjamas are very stylish and good, my son is currently using three we bought about one year ago and they are still in good condition. I bought my first training bras here and they were so comfortable and easy to wear, made wearing a bra not seem so scary! Recently visited the Gap store & there was up to 40% off including sale! 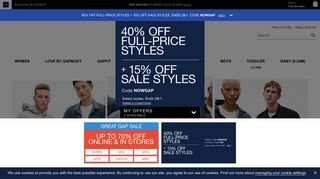 I love Gap their quality is great & their offers are fantastic. Whilst in there one of their reps informed me of the online app Gap where you register & every time you shop you get 5% off! Brilliant store & brilliant staff who couldn’t do enough!